In my musing “But what exactly?” I talk about eating meat and dairy which I don’t do on a regular basis, but there are exceptions. As I walk further down this vegan road, I’m noticing that there are two categories of exceptions. One is the 6-month exception. At Christmas I had lamb – this was the big diversion that seems to happen every 6 months or so. What about the monthly or weekly exceptions? Week to week, I pretty much stick to a vegan routine. Monthly? It’s come down to two things: feta and parmigiano. Becoming vegan has brought into vivid view the things that I truly appreciate and, surprisingly, feta and parmigiano are at the top of the list. (I’ve always loved them but didn’t realize how much more I love them than other types of cheese and dairy.) I don’t eat them often but once in awhile they are a nice treat. The recipe below calls for parmigiano. You can, of course, leave it out if you want to do a vegan version but it was a really nice addition. 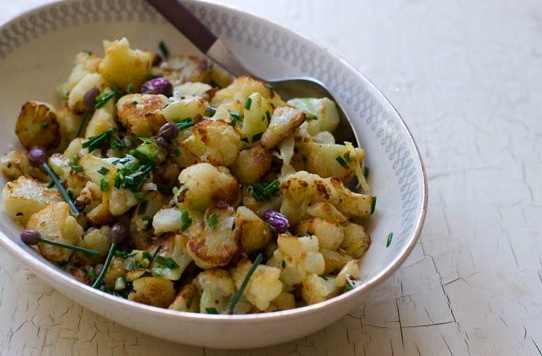 The kids loved this recipe – said it was way better than any other cauliflower dish I’ve made. It’s from 101 cookbooks. Serve it with rice, another veggie dish, and some BBQ meat for the non-vegans in the house and everyone’s happy. To prep the cauliflower, remove any leaves at the base and trim the stem. Now cut it into tiny trees – and by tiny, I mean most florets aren’t much larger than a table grape. Make sure the pieces are relatively equal in size, so they cook in the same amount of time. Rinse under running water, and set aside. Heat the olive oil and fine grain salt in a large skillet over medium-high heat. When hot, add the cauliflower and stir until the florets are coated. Wait until it gets a bit brown on the bottom, then toss the cauliflower with a spatula. Brown a bit more and continue to saute until the pieces are deeply golden – all told about six minutes. In the last 30 seconds stir in the garlic. Remove from heat and stir in the chives, lemon zest, and dust with a bit of freshly grated Parmesan cheese and a pinch of flaky sea salt (if you have it on hand). Serve immediately.